ASHEVILLE, NC — Life has ways of testing the strength and endurance of us in this world. Last year, Sheila McGuire, or Sheila Shine as most know her, was diagnosed with breast cancer. Although she is now receiving Medicaid, the financial burden of having not been able to work, coupled with other health care and living costs, has put her livelihood in jeopardy. In the midst of her health crisis, Sheila has also been fighting to keep her beloved mountain sanctuary home Spirits Rising, in Little Pine Valley of Marshall where she has lived since 2007, which is facing foreclosure. It is difficult enough to endure a trauma to one’s physical body, let alone have trauma in their sense of security and place of refuge. Sheila Shine. Photo by Leigh Monson. Sheila has been a good warrior and has been fighting for life. Since August 19 2014, she has endured five surgeries including a double mastectomy, along with dealing with chronic back pain from an injury she sustained when hit by a drunk driver in 2005. Her final surgery blessedly came back with positive results of being cancer free as of June 19th, 2015. She still has to be careful, especially with her nutritional needs and stress levels. She’s out of the woods and feeling much better, but she still has a long road paved with more surgeries and medication regimens ahead of her. Now let’s help her get back on her feet financially. With the support of a wide network of friends and festival family, Sheila has been able to open up and talk about her experience with others and is working toward manifesting her dream of making her home a mountain retreat for musicians and others with cancer to recuperate. She has been receiving much support within her community of friends worldwide. In Asheville, New Mountain has generously offered their space to host multiple benefits, in which Sheila is actively participating in, throughout the coming months with the first being held on Tuesday, July 21st in the outdoor courtyard. Performers set for the evening include The Risin’ Shiners (ft. Bobby Miller, Taylor Martin, Drew Matulich, Josh Stack, and Rob Parks), Adrian Zelski spinning world beats, The Big F’N Deal Band, Melmac Pink of Asheville Hoops, Kenny the Clown, a drum circle and other activities with DRUMSTRONG, as well as poetry by Barbie Angell and David Weber. Doors will open at 7pm and the music starts at 8pm. There will also be a silent auction/ raffle and educational materials on site. DRUMSTRONG is a supporting partner in the “Help Sheila Shine On” events where folks will enjoy great music, solid health resources, great art/raffles, fun activities, and a powerful drum circle to BEAT cancer. DrumsForCures produces DRUMSTRONG events raising awareness & funds in support of cancer survivorship, education & research through Rhythm. All cancers, All populations are represented. DRUMSTRONG’s Scott Swimmer writes, “Join DRUMSTRONG Rhythm as we celebrate survivorship and boost our dear friend Sheila to higher ground. Lord knows she needs your support; and in doing so, also benefit thousands of people globally.” Bring your drum for an opening ceremony to drum in honor of, or in memory of, for your own fortification or just out of the goodness of your heart. The Sheila Shine Fund will blossom by your participating in committing to share your pulse and making tax deductible donations through DrumsForCures’ 501(c)3 non-profit organization. Donate via PayPal at scott@drumstrong.org and note in honor of Sheila Shine. For each benefit, we are seeking donated items such as artwork, music/ art lessons, gift certificates to local businesses & restaurants, and other creative ideas. We are also in the planning phases for the events further out; if you would like to perform, contribute, or have any other creative ideas, please do let us know. People Sheila calls “Angels” and great manifestation have kept Sheila moving forward through these trying times, however, it is time for the community and circles of loving relationships that she has created to come back and help Sheila to keep shining. When we give for those in need we are truly giving of self. Please come and celebrate life with Sheila, reconnect, meet a beautiful shining soul and support her as she travels this road. Friends of Sheila Shine have also created a Go Fund Me account for anyone that would like to donate: www.gofundme.com/SheilaShineFund. Stay up to date with more news from Sheila & Friends and about the benefits at her facebook group www.facebook.com/groups/SheilaShineOn. Sheila “Shine” McGuire has touched countless lives and grew up in the sunshine state where she was an integral part of the alternative music, dance and performance scene. 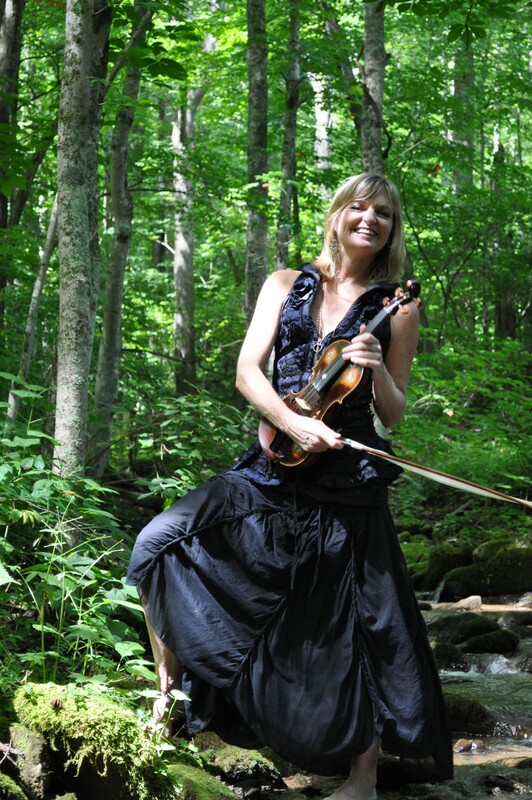 She was drawn to the energy and lush mountains of WNC in 2007 from Fort Lauderdale, Fl with the idea in mind of a place called Spirits Rising, nestled high on the mountains, next to a riverbank, with lots of trees. She found the physical manifestation of this in her home, which was an unfinished shell of a cabin upon arrival, with a mud pit for a road, and needed a lot of work to make it into what it is today. Sheila has since shared use of her home with many a traveler and musicians passing through, providing a safe haven and place to relax in nature and regroup. The vision of Spirits Rising started as a place for musicians to convene and retreat, a gift back for musicians because she is so grateful for all they do, as well as being a legacy for her father (who passed in 1998) and all he did in life. As she got older, she starting having friends with health problems and terminal illness and envisioned Spirits Rising to be a sanctuary for them as well. When she was officially diagnosed with breast cancer last year, she realized that she also needed this space for herself to recuperate in those same ways. As friends traveled in from coast to coast to help her out, she saw how her childhood vision has become her mission in life: To create a healthy & musical space and support base for those in need. 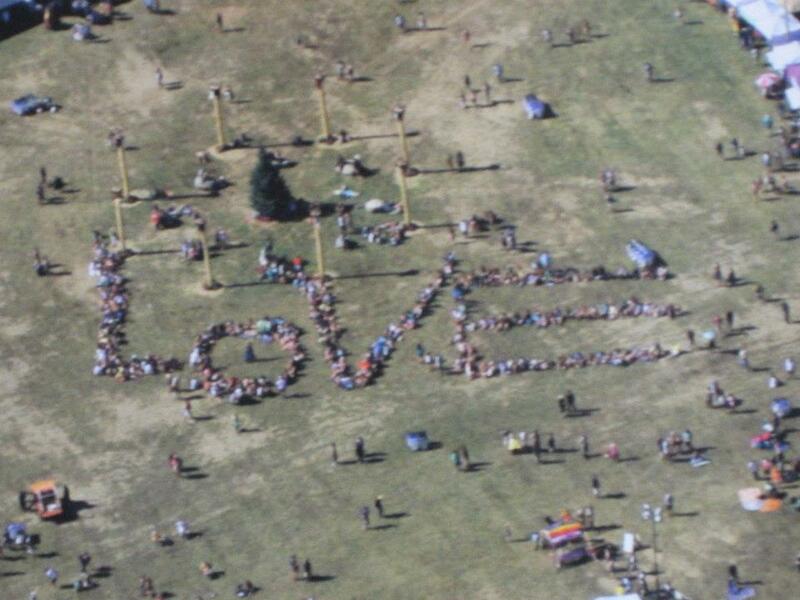 Sheila Shine standing in the center of the “O” when she motivated folks to spell out “LOVE” at a music festival. Her life changed completely when she started going to music festivals with the first Langerado (of which she attended every year) and also with her experience at the first Jam Cruise in 2004 and beyond; she immersed herself in the sense of family and community that comes with it. She loves every bit of the festivals, all the love, fun meeting people, dancing, hooping, and hugging, as well as keeping an eye out for anyone in need at the event, and, of course, the music. Circles of community fan out around Sheila like a mandala. Always one to create space for friends, Sheila has provided a loving heart and warm smile for those she has known for years, as well as those she may have just met. Life is full of Angels and possibilities, and circles of love surround it all wherever Sheila goes. Her home has been a respite for the weary traveler, a mountain retreat to find a sense of place and soul, and a sanctuary for musicians where music is integrated into the space like the trees in the forest. Spirits Rising has been a manifestation making its way into reality and has been a place of stillness and peace for all who set foot on the mountainside. Stay up to date with more news from Sheila & Friends at her facebook group www.facebook.com/groups/SheilaShineOn.